It’s no secret that baking brings joy, both for the baker who is expressing creativity in the kitchen and to the loved ones who get to enjoy the fruits of their labor. And while some bakers enjoy the manual process, we know many truly appreciate the convenience and precision that can be achieved with small appliances, bakeware, gadgets and more. Discovering the best gift for the passionate baker in your life can be a challenge, whether your loved one is just discovering a new hobby or they’ve perfected cake, pie, and cookie creations. We’ve developed a list of baking gift ideas – for birthdays, anniversaries, celebrations, and holidays -- that offer a variety of baking solutions, from that very first gleaming KitchenAid® stand mixer to the newest innovative gadget. At the center of many baker’s worlds is their stand mixer–and whether they are looking to upgrade or they are wishing for their first stand mixer, KitchenAid offers a range of options. Bakers with limited counter space or a love of small batch baking might prefer an Artisan® Mini Design Series Stand Mixer, which comes in five colors and with a 3.5 quart glass bowl for greater visibility. Also available is the KitchenAid® Pro 600 TM Series Stand Mixer, which features a 6 Quart Stainless Steel Mixing Bowl, great for dense ingredients and large batches. 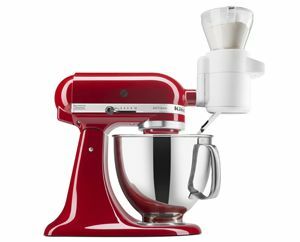 A KitchenAid® Stand Mixer is a highly coveted and top gift for bakers. It's almost like a right of passage into the next stage of life for many - whether it be through the celebration of marriage, graduation or another special occasion. And there’s little better than watching a baker’s face light up as they open this gift. Bakers who already own a KitchenAid® Stand Mixer and strive for precision and consistent results every time will love the new Sifter+Scale Attachment. This all-in-one baking tool that accurately measures, thoroughly sifts and automatically adds ingredients directly to your mixer bowl in just one step, making baking faster, simpler, and more enjoyable for the cook in your life. Using freshly milled grains brings a hearty taste and texture to your baked goods. And when you bake with home-ground flour you get all of the good you could possibly get from a grain. This All Metal Grain Mill attachment grinds wheat, oats, corn, rice, and other low-moisture, low-oil grains, and offers the versatility to grind from a 'cracked' to extra-fine consistency, for just the right texture. This is an ideal gift for a baker in your life who has all of the basics down and wants to expand and explore new possibilities – or a baker who cares a lot about using unprocessed products. PRECISE HEAT MIXING BOWL: DID SOMEONE SAY CHOCOLATE FONDUE? Give the gift that allows the passionate baker the ability to temper chocolate, proof bread dough, make fondue, soups, yogurts and more with the KitchenAid® Precise Heat Mixing Bowl, designed exclusively for the KitchenAid® Stand Mixer*. This mixing bowl features Precision Temperature Technology, which allows you to select any temperature from 70° to 220° F (21° to 104° C) in two degree increments. If the stand mixer has already been claimed on their registry, or if they love the mixer you got them last year, this new attachment will breathe life into a classic gift and can bring hours and days of fun in the kitchen. This affordable, dishwasher safe beater reduces mixing time and reduces mid-mixing spatula gymnastics as its flexible edge scrapes the contents from the bowl. It can also be used to wipe the bowl clean after mixing, taking some of the less fun steps out of the baking experience. Pair this great gift idea for bakers with some specialty ingredients, a new recipe book, or with another attachment to create an unforgettable basket for your loved one who loves to bake. So many baked goods go well with a scoop of ice cream – and by giving the gift of an ice cream attachment, the baking enthusiast in your life can serve their desserts a la mode from here on out. The KitchenAid® Ice Cream Maker attachment* can produce 2.0 quarts of ice cream, gelato or sorbet in 20-30 minutes, and elevate whatever’s cooking in the oven. So many holidays and special occasions revolve around baking and baked goods, and giving baking-related gifts to the cooks in your life are thoughtful ways to boost their craft, encourage their creativity, and make every occasion warmer and brighter.